May I call you Phil? Or, perhaps you’d like me to address you by several other titles: Deep State Hack, CNN Loudmouth, Globalist Dandy, Soros Puppet? Once again, last week, you were on the Clinton News Network, spouting more threats against the President of the United States. Why the Secret Service hasn’t visited you is a mystery akin to who really built the pyramids. Defends Putin? That’s all part of your Russian fairy tale line. You of all people, being ex-CIA, Phil, should know a good Maskirovka when you see it. That is, unless, you and your Deep State blackguards are part of the Maskirovka yourselves. Hmm…It’s almost like the whole Russian Collusion Story was all created by the intelligence community. Hey, Phil: the thousands of hard working, honorable, patriotic, brave Americans who work for the FBI are SICKENED by the filth that rose to the top of that organization, like poisoned cream, and attempted to not only steal an election, but to oust a sitting President in some kind of banana republic coup d’etat. The President is not intimidating Mr. Wray. He is telling him the facts. The facts are that Mr. Wray works for the President of the United States and We the People. When any government official’s actions threaten the Office of the President and the American people, it is time for that official to not only step down, but to be investigated and to be given due process, a term globalist thugs like you sneer at. Duty, Honor, Country: three terms that you and your Deep State traitors have all but forgotten on your descent into the maelstrom of madness and corruption. The officials at the FBI, the CIA and every other government agency are there to serve the citizens of the United States. These agencies are not your personal avenues to wield power and to manipulate our laws, in an attempt to destroy a sitting President, while trying to justify the failed election of a criminal witch. I was thinking of other people who have been around since 1908, people like your globalist masters: the Rothschild’s, the Morgan’s, the British Empire, Skull and Bones, the people who write your paycheck, the Pezzonovante, who make you dance like a puppet, on the end of a string. Here’s a little news flash for you, Phil. The American Patriot has been around since 1775. The American Patriot who detests globalist Redcoats like you has been around since 1775. The American Patriot who loves the freedom you and your Deep State traitors detest, has been around since 1775. Let that sink into your cranium. You’re not going to win. Just like you didn’t win the election. Outstanding, Mr. Starmann. You said everything I would have, except you said it much more politely and professionally. Thank you for all you do. You are a true Patriot. Thanks! I’m sick of Mr. Mudd. Ray Starmann! You are right up there as a modern day Samuel Adams. A modern day John Adams. A modern day Benjamin Franklin. A modern day Thomas Jefferson. Please, whatever you do, don’t stop reporting the truth that there are those in this country whose goal it is to destroy our great nation and all we stand for. God Bless you! Epic. And correct: they’re not going to win. 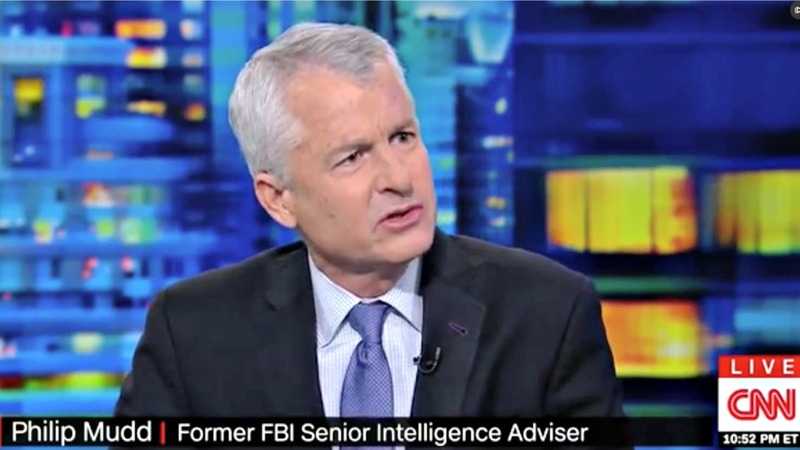 Phil Mudd is way out of his league. He is walking on thin ice when making comments about the President. It is only a matter of time when he, and others like him, will feel the wrath of the President. This Mudd guy is why the FBI should not exist in the nation’s capital. There may be a need for federal investigators to engage with local law enforcement in federal crimes. But the “Agency” or accountability problem with a unit operating inside the federal capital is now open for all to see. We have a Justice Dept. We have a org chart that goes from a US Atty to the Atty Gen. And the US Atty is working on cases referred by local law enforcement and in concert with local officials. Accountability is not cluttered. But to have a standing group of investigators who are not connected to a local law enforcement is inviting trouble. Who oversees the DC office of the FBI, how many layers of chaffe are there? How easy was it to run counter-intelligence ops against political enemies? The FBI can be used to spy on political opponents. Local enforcement officials can’t stop it from happening. Nixon had his enemies list. Now we see a long list of FBI ers who have no point of contact with local elected officials or local enforcement. And they go off hunting for political enemies of their favorite boss and ignore bad behavior by their favored politicians. Infowars reports: The globalist outlet refers to a book titled “The Internationalists,” to explain the origins of the “liberal international order” as a move to “make the waging of aggressive war illegal,” which is why it must be “defended like never before.